Specialist plating equipment designers and manufacturers, NHE, have completed the installation of a highly sophisticated electroless plating line that is meeting the specific needs of leading industrial print head manufacturer, Xaar plc. 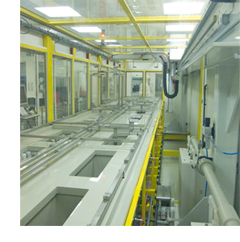 The facility, installed at Xaar’s Huntingdon manufacturing facility, fulfils a number of key processing requirements – not least the need to operate within the company’s clean room manufacturing environment. The Plasticraft system comprises a fully enclosed process line that is dedicated to the electroless plating of Xaar’s acclaimed X1001 printer head, which is installed on printers designed for a range of applications – from barcode labels to ceramic printing. Featuring 1000 individual nozzles, the plating, onto a ceramic substrate, has to achieve stringent parameters in terms of consistency and thickness – a coating of just a few microns, for example, is required. The operation is centred on two parallel rows of tanks – one of which is dedicated to surface preparation, and the other to the application of plating process solutions and rinsing – with both mechanical and air agitation applied at key positions. The Plasticraft design includes a 3-Axis transportation and fixturing system, whilst the company also liaised closely with Xaar to accommodate both the company’s air filtration requirements and the delivery of chemical solutions, pumped from reservoirs external to the clean room. The system is fully automatic, including chemical dosing and data logging operations, and conducts a continuous analysis of the chemical solution to ensure that its make-up remains consistent throughout the process. The combination of solution, processing time and temperature, says Plasticraft, is central to the quality results that are achieved. “Although compact in design, the line fulfils complex handling and electroless plating operations, and is an excellent demonstration of our understanding of plating equipment and processes, and their application in a clean room environment,” comments NHE Managing Director, Mike Priddle. “Xaar are regarded worldwide as one of the main manufacturers and suppliers in the specialist industry it supplies, so we are delighted to be able to work closely with the company to enhance its high quality manufacturing process,” he concludes.